Many pet-related stores involve themselves with the pet community either globally or locally. 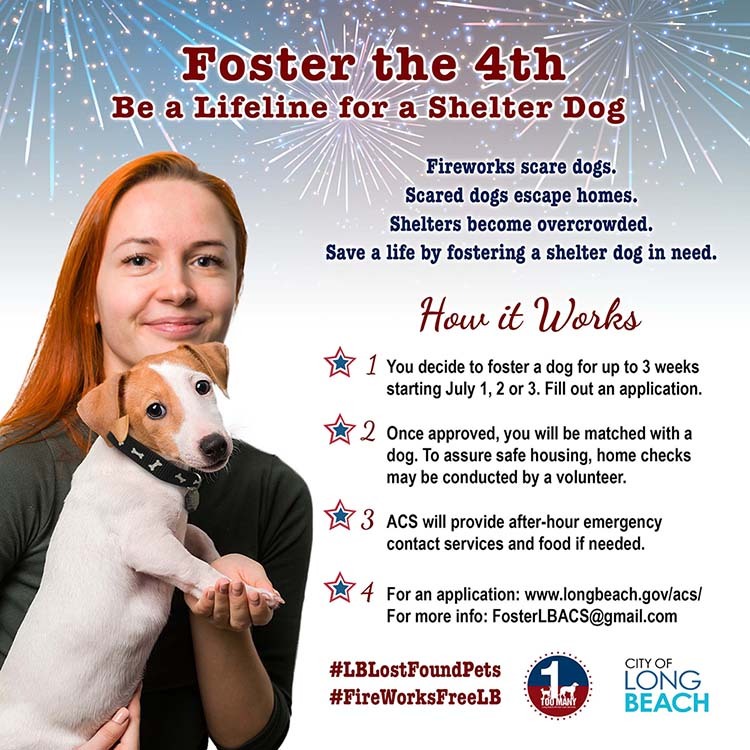 Pet Food Express, a high-quality pet-supply chain with stores throughout California, donates funds to animal shelters (including our own at Long Beach Animal Care Services), rescues and police K-9 departments, and they host weekly pet-adoption events as well from local rescues and shelters. Eleven of the stores have their own cat-adoption center, and lucky us—the Long Beach store at 4220 Long Beach Blvd. has one! 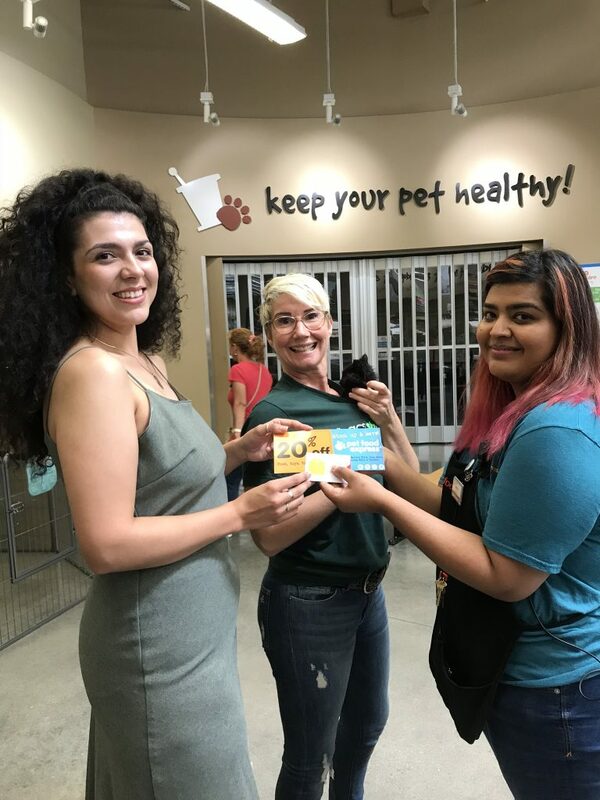 The Long Beach store opened in March, 2016; on Sunday, June 24, the pet food store celebrated its 200th adoption (that’s an average of 100 cat adoptions a year)! All the cats in the center come from ACS, no matter the age, color or number of legs. They all go home, too! Long Beach resident Daisy Fernandez adopted number 200, and she’s smitten with the kitten. Daisy’s sister Jackie had noticed a black kitten at the store. The two women went to see him, and Daisy fell instantly in love. “He sounded like a little love machine, purring and purring,” Daisy said. The kitten’s name was Lemmy because he was found on Lemon Avenue. Daisy, of course, named him T’Challa. T’challa (center, with Somers) and Daisy (left) received gift cards and other goodies from Norma Aguayo (right), PFC’s manager. Photos by Kate Karp. “He’ll get lost in your hair!” Julie Somers, PFE’s Cat Lady in Charge, told Daisy. Julie Somers couldn’t do adoptions like T’Challa’s without a dedicated team. 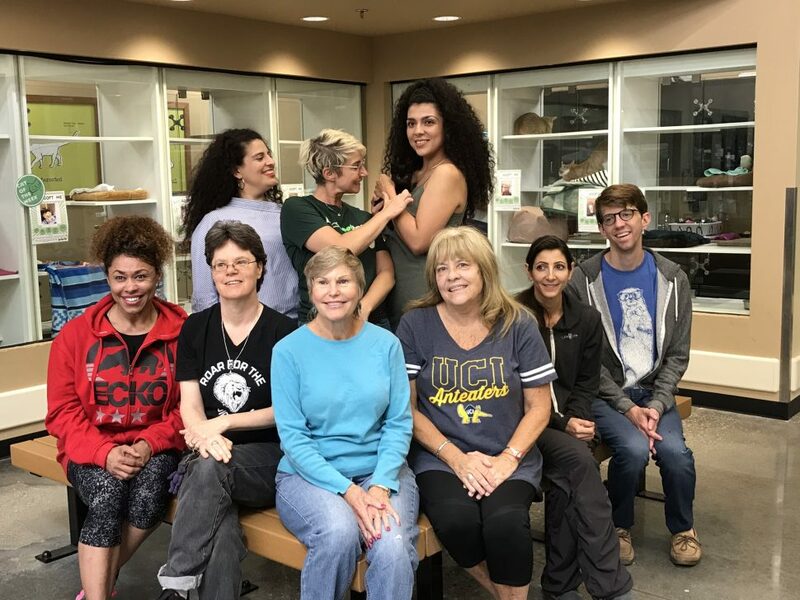 Bottom, from left: cat-caring volunteers Colete Levingston, Aostara Kaye, Ann Tyree, Katie Ford, Marisa Strange, John Czopek. Top: Jackie Fernandez, Somers, Daisy. Lost in hair: T’Challa. Of course, I’m taking the opportunity to sneak in a few adoptions. Cat Guy John Czopek is here to introduce you to a few of them. All have been spayed or neutered and all have been vetted. Pinky Lee, 5-year-old male, found as a stray. A “one-cat show” (should be an only kitty) with an affinity for catnip. Polly, 2 years old, is an action movie star—she can leap cat furniture in one bound. She, too, appreciates a bit of catnip every so often. Lew Lew is a 4-year-old male, cuddly as can be although he, too, was found as a stray. Dear little Cali Mama. Cali Mama came in with her kitten, who of course was adopted right away.immediately. She’s only 2 years old. She had to have a leg amputated, but as you can see, it doesn’t slow her down any. ACS wants to remind you that fireworks scare cats, too. Please keep yours indoors during this time, in as safe and as quiet a place as you can find.